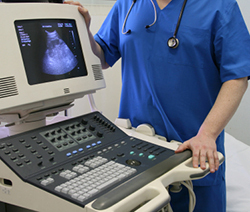 An ultrasound examination, also known as ultrasonography, is a non-invasive imaging technique that allows internal body structures to be seen by recording echoes or reflections of ultrasonic waves. Ultrasound equipment directs a narrow beam of high frequency sound waves into the area of interest. The sound waves may be transmitted through, reflected or absorbed by the tissues that they encounter. "Ultrasound waves that are reflected will return as "echoes" to the probe, and are converted into an image. "The ultrasound waves that are reflected will return as "echoes" to the probe, and are converted into an image that is displayed on the monitor, giving a 2-dimensional "picture" of the tissues under examination. The technique is invaluable for the examination of internal organs and was first used in veterinary medicine for pregnancy diagnosis. However, the technique is also extremely useful in evaluating heart conditions and identifying changes in abdominal organs. Ultrasonography is very useful in the diagnosis of cysts and tumors. Anesthesia is not usually needed for most ultrasound examinations, unless biopsies are to be taken. The technique is totally painless and most dogs will lie comfortably while the scan is being performed. Occasionally, if the dog is very frightened or fractious, a sedative may be necessary.